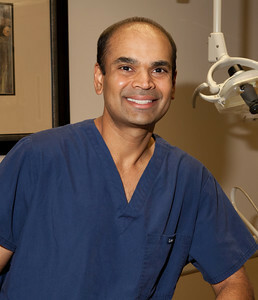 Dr. Patel’s goal is to achieve the highest quality of comprehensive dental care possible. We believe the only way to successfully attain long term oral health and beauty is to start with a solid dental foundation for every patient. This begins with a comprehensive new patient exam. As a new patient, you will initially be scheduled with one of our highly qualified dental hygienists. At this visit, we will review your medical/dental history, take necessary digital x-rays, measure your gums and establish overall periodontal health. Once all of these factors are reviewed, Dr. Patel and his staff will determine a personalized Soft Tissue (Gums) Treatment Plan to meet your individual requirements. Oftentimes, all of this can be completed during your initial appointment. The exception to this would be if you require a more extensive cleaning such as a full mouth debridement or scaling/root planing. Once your Soft Tissue Treatment Plan is completed, Dr. Patel will assess your overall dental health and discuss any current or potential Hard Tissue (Teeth) Concerns. We will then schedule future Hard Tissue Treatment appointments with Dr. Patel along with continuing care appointments to help maintain the Soft Tissue. Although this is an ideal scenario, Dr. Patel realizes that in the real world a dental emergency is sometimes what prompts an initial visit to his office. If this is the case, our main goal is to get you comfortable and out of pain. Once this is accomplished, we will proceed in the comprehensive manner as discussed above. Dr. Patel has lived in the Houston area since his toddler years. He attended Texas A&M University where he earned his Bachelor of Science Degree. His postgraduate education was completed at the University of Texas at which time he received his Doctor of Dental Surgery Degree. When Dr. Patel established his own practice in 2003, he did so with a goal and a vision in mind to create a dental practice that offers the highest quality of care available. He knew that in order to provide the best care he needed to build a practice that would focus on the needs of the individual and establish clear communication with every patient that walked through his door. Dr. Patel has made that kind of communication a main focus in his practice and keeps a high standard of patient care. Aside from opening up clear and comfortable communication, Dr. Patel does his part by consistently participating in continuing education. He knows that by doing this he gives his patients the assurance that his professional abilities are the most up to date. Dr. Patel and his wife live in the Pearland area with their two young daughters. In his spare time, you're likely to see Dr. Patel either spending time with his family or playing golf. He is quite the enthusiast when it comes to his golf game. As a testament to his personality, he puts the same amount of meticulous attention to golf as he does to dentistry. Amelia has been a part of Dr. Patel’s team since 2012. She graduated with a bachelor’s degree from Texas A&M’s Biomedical Science Program. She then went on to get her degree in dental hygiene from Wharton County Junior College in 2011. Amelia enjoys her profession and is especially excited about the role she plays in providing comfort and care to our patients, young and old. Amelia is a native Houstonian and is recently married. She and her husband currently reside in Pearland. When not practicing hygiene, you’ll find Amelia out on the soccer field or playing kickball. She is also an avid reader and particularly enjoys Science Fiction/Fantasy books. 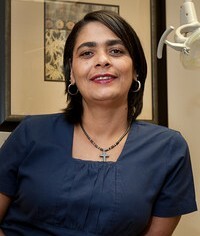 Maria has been in the dental field since 2001 and with Dr. Patel since 2015. She began her career as a Dental Assistant and later graduated from the Lone Star College Dental Hygiene Program in 2007 with an Associate’s Degree in dental hygiene. Maria is very motivated and always looking to gain knowledge and grow. This is evidenced by the fact that she went on to attend Texas Women’s University and received her Bachelor’s degree in Science. 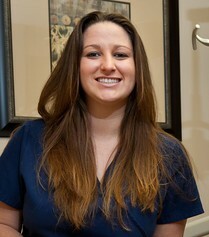 Maria enjoys working with patients and takes great pride in providing excellent dental care. Maria was born and raised in Houston. She has three young children who keep her extremely busy with school and sports activities. In her spare time she likes watching movies, going to amusement parks and spending time at the beach. Millie is Dr. Patel's registered chair side assistant. She graduated from dental assisting school in 1996 and loves it as much as she did on her graduation day. The most accurate description of Millie is that she is a work horse. Her response to that is always that she loses track of time because of the fact that she really loves what she does and takes pride in taking care of patients. She gets a lot of satisfaction from making our patients happy. Millie moved from New York to Houston in 1988 and her four grown children soon followed. Although she is a Texas transplant, she now considers the Houston area her home. In her spare time Millie is kept quite busy by her four grandchildren and her love of the game of bingo.